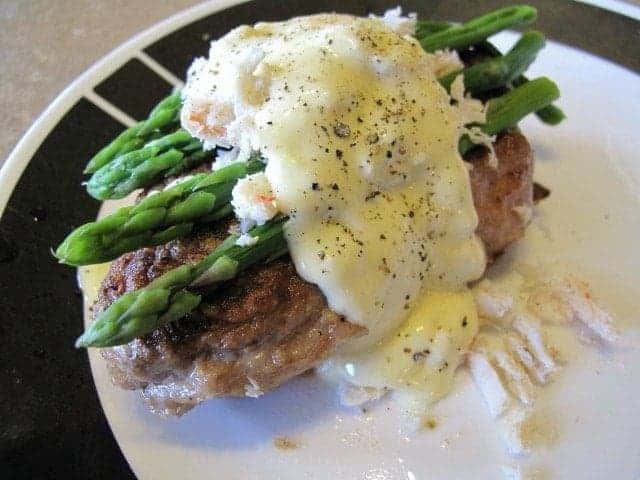 This absolutely decadent steak oscar recipe combines 4 of my favorite foods; a darn good steak, crab, asparagus and Hollandaise sauce. This Steak Oscar recipe is one of those dinners that will make you feel like you are eating at a fancy restaurant. As far as I’m concerned, Hollandaise IS a food all by itself. This was beautifully easy to make, but packs a punch aesthetically, what an impression it would make to serve to guests! Yes, traditional Steak Oscar uses Bernaise sauce on top, but since I can whip up Blender Hollandaise in the blink of an eye, I went with a little more non-traditional approach to it! Take your asparagus, wash it, and place it in a microwaveable dish with a bit of water to steam them. Put it in the microwave and get it ready to go. Open and drain your can of crab meat. If there are any cartilage bits in the can, remove them. Place in a bowl and set aside for heating later. In a dish large enough to flour your steaks in, put your salt,pepper and flour in and mix it together. If you want your steak done more than rare, you need to take a mallet to them, and flatten them some. 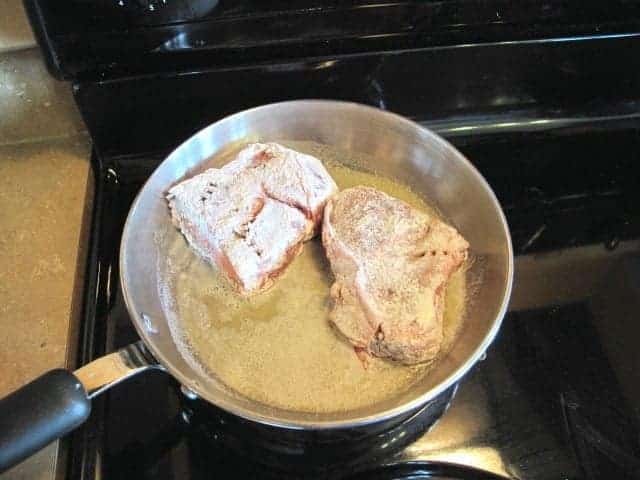 You can cook it the thickness of my two steaks to a medium rare, but it takes longer and you risk burning or overdoing the outside. I like my steak very rare, so I left mine thick. Flour all sides of your steak. I only had strip loin steak, which I cut in two for better serving sizes. Tenderloin, of course, is far better melt-in-your-mouth wise, but not everyone just has tenderloin hanging around the house, waiting to be used. I definitely wouldn’t waste this effort on a poor steak, but rib or strip loin surely do a great job as well. Take your butter and melt in in the pan with the oil. This stops the butter from burning. I assume. My butter doesn’t burn when I do it this way, so, that would leave one to believe…it helps the butter not burn. Time to cook those babies up! Put them into the butter/oil mixture and start them cooking, about 5 minutes per side, or to your preferred doneness. While they are cooking, take your butter for your Hollandaise sauce. Put it into a small pot, and put it onto a medium heat burner, you want to slowly bring it to a boil. Time to start your asparagus! Get that microwave a cookin’. While your butter is melting, and your asparagus steaming, take your eggs and put them into the blender. Time to add in your hot sauce as well, and shake a little salt in there if you so desire. Now, it might just be time to flip those steaks, so go ahead and do so. Your butter should now be really hot, so grab it and if I were you, transfer it to a measuring cup. If you think you can pour it into your blender through this little hole with a pot, go for it. I had a camera in one hand, and hot butter in the other. Measuring cup it was! Start the blender, then slowly pour the very hot butter into the blender, adding it all in a slow stream until it’s completely in there and mixed up. You are cooking those egg yolks! And this is what it should look like in there when its done, a rich, smooth, creamy sauce. Take out your asparagus, and put the bowl of crab into the microwave now, and heat that up for less than a minute. It takes no time at all to heat. Place 4 spears of asparagus across each steak. 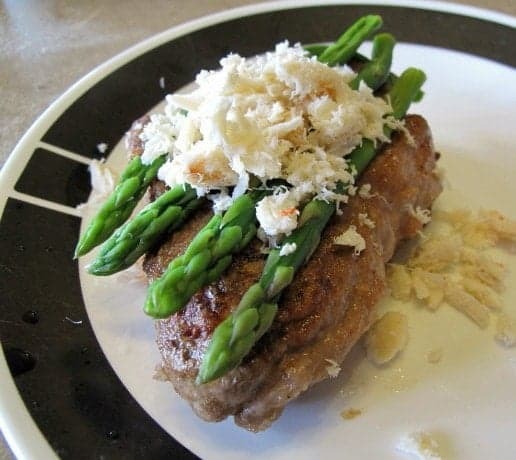 Take your crab, which is heated by now, and place some on top of the asparagus. Top your steak oscar off with glorious Hollandaise sauce, grind some fresh pepper on top, and serve! Don’t feel like you have to stick with a tenderloin steak, choose any good steak that you enjoy. Steak Oscar is my favourite on a thick, medium-rare tenderloin however! Don’t use the crab flavoured pollock even though it’s cheap. It’s not worth it, just grab a tin of canned crab meat. While I enjoy the steak rare, cook the steak to your personal liking. The asparagus is better when it’s cooked to just slightly crispy. You do need to be able to cut through it and it should have a little crunch to it. I made mushrooms my last time around making this and they are GREAT with it, however that isn’t traditional Steak Oscar. Feel free to fry up some mushrooms if you want! Happy cooking! Try out my Steak Marinade if you are looking for another delicious steak recipe, or even my Crockpot Flat Iron Steak with Portobello Mushrooms. 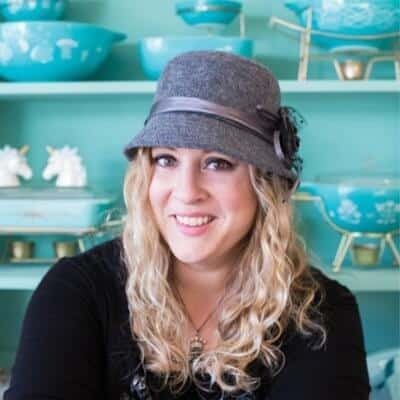 PIN THIS RECIPE to your DINNER IDEAS or LOW CARB RECIPES Board and Remember to FOLLOW ME ON PINTEREST! 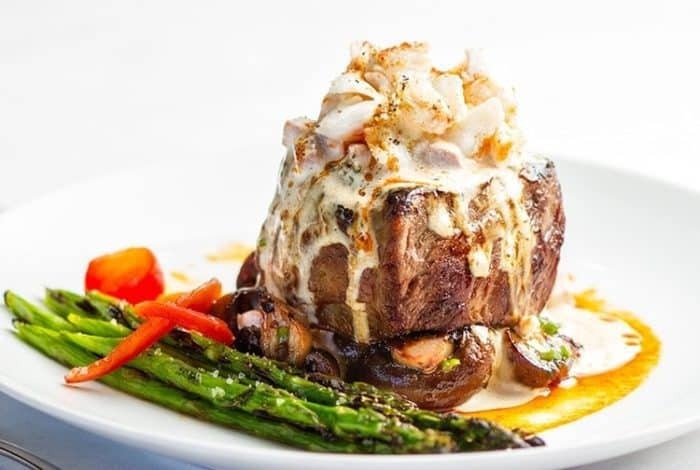 Easy but absolutely decadent Steak Oscar recipe! This is sure to make dinner time a special one for the whole family! While traditional Steak Oscar calls for Bernaise, my trick of topping with blender Hollandise makes this the easiest fancy dish ever! Now. If you want your steak done more than rare, you need to take a mallet to them, and flatten them some. You can cook it the thickness of my two steaks to a medium rare, but it takes longer and you risk burning or overdoing the outside. I like my steak very rare, so I left mine thick. Flour all sides of your steak. Take your butter and melt in in the pan with the oil. Put them into the butter/oil mixture and start them cooking, about 5 minutes per side, or to your preferred doneness. Put it into a small pot, and put it onto a medium heat burner, you want to slowly bring it to the point where it is steaming. Time to start your asparagus! Get that microwave a cookin'. 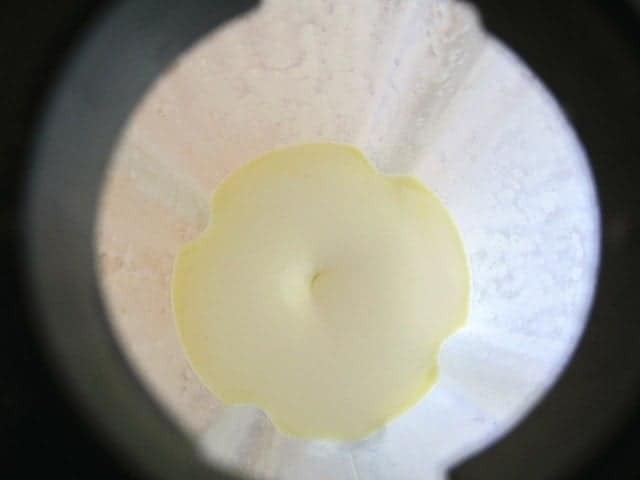 Your butter should now be steaming hot, so grab it and if I were you, transfer it to a measuring cup. 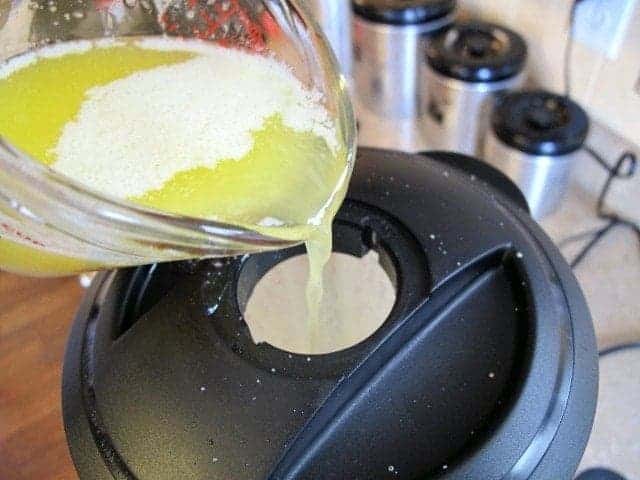 Start the blender, then slowly pour the hot butter into the blender, adding it all in a slow stream until it's completely in there and mixed up. You are cooking those egg yolks! Top it all off with glorious Hollandaise sauce, grind some fresh pepper on top, and serve! You can add all SORTS of vegetables to this recipe! I love to use fried mushrooms, zucchini, sometimes red peppers, you don't have to be traditional! 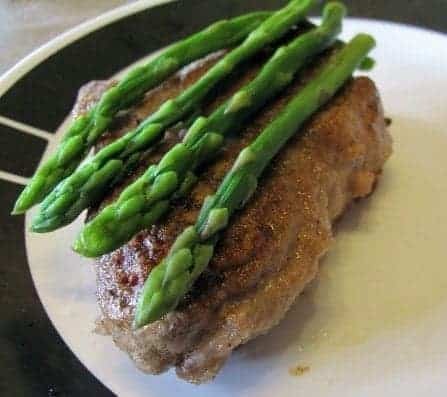 What is the steak sitting on? There is something between the bottom of the steak and the top of the plate.It was never mentioned. If u cook ur tenderloin 5 minutes on each side on high u will have shoe soles. I cook mine 1 minute on each side then let them rest for 5 a they’re perfectly med rare. The photo’s have MUSHROOMS, but it’s not in the recipe. ? It’s not traditional to have mushrooms, but for my second photos ( you can see the old ones are in the post still and no mushrooms) I added them in since I love them. Feel free to fry some up as well! Cool site with great photos. Enjoyed. Wow, that was great. The careful step-by-step instructions were perfect. I did make my hollandaise on the stove top with my usual method, but the timing was just right. Coming from a professional, institute trained, chef… You wouldn’t want to “boil” your butter. First, that would indeed burn the milk solids. Secondly, you wouldn’t “boil” the butter, even to make a “burre”, or in laymans terms, “burnt butter”. (which you would DEFINATELY NOT WANT in a hollandaise sauce!) Incidently, I use hollandaise sauce at home for this sometimes as well, but, “properly” it should be a bernaise sauce instead – that is, hollandaise made with tarragon, or tarragon vinegar, added. 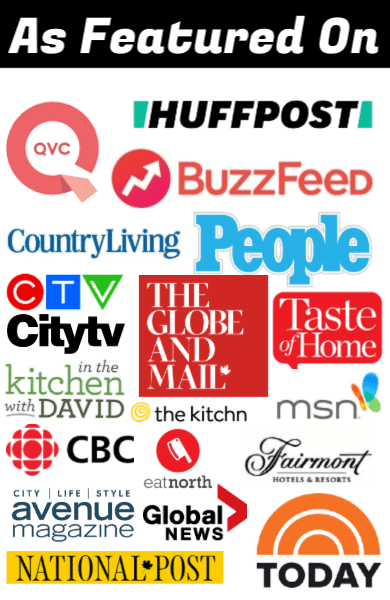 All this being said, don’t misinterpret me – you are a wonderful cook, with a wonderful website!